Stress is a response of the nervous system to situations that seem beyond one’s control. It is the internalised result of external overloads. The clinical meaning of stress refers to a situation that disturbs a person’s mental health. This may lead to other mental health problems, such as anxiety and depression. Excessive work hours, deadlines and work load, conflicts with people at work, pressures of hierarchy and miscommunication are some of the factors that cause stress. Even if we work at the best of our efficiency, some problems may never be fully resolved. Don’t get so caught up in the hustle-bustle of life that you forget to take care of your needs. Nurturing yourself is a necessity, not a luxury. Unless you feel fit in the mind and the body, you cannot deliver your best in your professional or your personal life. Managing stress is just a matter of distracting your mind from the current situation. Realise that even if the situation is hard to deal with, it is “outside” you. Once you step out of the situation mentally, you will realise that you’re just an observer. This often works for me and I realise I am not the situation. It makes me feel relieved and composed enough to take care of it. Make some time to unwind at work. When you reach your office, don’t just get to the desk and start browsing through the pile of files. My former boss would sit calmly as soon as he’d arrive and close his eyes or listen to his favourite song before starting work. Make some time to relax at work and make it a part of your schedule. Don’t let other obligations drag you down. Ensure you make time to recharge your batteries. Making this a habit increases your productivity. In fact, most successful MNCs like Google Inc., have nap stations where associates can sleep if they feel too bogged down. There are several health benefits of a nap. Talk to others at work. The fact that they go through the same rut as you, makes them a part of the same boat you’re sailing in. So, there’s a lot to talk about. You may share a joke or have a conversation. Spending time with seniors who enrich you is also great. Get inspired by their success stories. A strong support system will act as a buffer for the negative effects of stress and bring a smile on your face. There are several health benefits of smiling too. Do something you enjoy every day. Whether you’re at your desk or on your couch at home, make time for activities that bring you joy. Invest in a hobby. Music relieves stress. You can learn some guitar and impress your colleagues on a Friday evening! I love to click pictures and learn more about photography. Dance, read a book, watch a funny video — whatever you fancy. Exercise regularly. 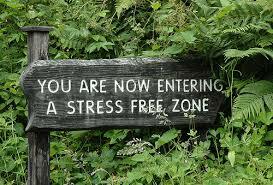 Physical activity plays a key role in reducing stress. Exercise for 30 minutes, at least three times a week. Nothing beats aerobics when it comes to releasing physical and mental tension. Working out releases endorphins – a “feelgood” hormone. Improved self-esteem is another psychological benefit of exercising. If you want a bit of that at your desk, here are some desk workout ideas. Eat right. The golden rule: never skip breakfast. Oats and muesli with egg go a long way in beating an atrocious Monday. Eating right keeps your energy high and mind clear. Eat balanced, nutritious meals throughout the day. And if you’ve to squeeze in only 10 mins for lunch, do not resort to fast food as it has been proven to cause depression. Avoid situations that make you feel stressed. Avoid unnecessary arguments and conflicts that drain your energy. While ignoring a problem is not always the best way to reduce stress, be assertive about your point of view if it comes to that, instead of worrying about it. They say a good sleep or a good laugh can resolve anything. Sleeping well is essential for mental health. Maintain a good sleep routine. Try something calm and relaxing before you go to bed, like listening to music or reading if you have difficulty falling asleep. Go for a walk. Spend time in nature. Call a friend. Have cup of coffee or green tea. Watch a movie, sing a song, go partying but don’t let stress make you live any less than you deserve. A very well described blog explaining some really good ideas to live a stress free life. You can also try experimenting with aromatherapy which actually also have a play on your emotions. It’s good for your health as well as scientific studies have found aromatherapy helps you to beat stress levels. I love fragrances that’s altogether a different story but it actually keeps me happy. I buy scented candles and reed diffusers usually from http://www.purefragrances.com and to be honest, I have been more than satisfied. Then like you have already brought out “The ME Time” that’s very essential because digging deep into yourselves to find out what’s happening around is essential to keep ourselves moving forward always. Altogether I feel, you haven’t missed any point I guess when it comes to beating stress and depression I guess, loved reading your blog. Thanks for your comment. We try our best to produce good content that will resonate with people living real lives. So, stay tuned for more interesting health and wellness blogposts. PS We checked our your website, PureFragrances. Looks neat and cool. Thanks for dropping by! It is true that we should not let stress take over our lives, though it is easier said and done if we try engage in the right activities it can be possible. Stress can come from different aspects in our lives it can come from work, home even emotional stuff. It is important for us to find that one thing that relieves our stress because each person has a different way that works. I like that instead of suggesting any specific activity you just gave us general guidelines that can be applied to anyone. Keep the good posts coming! Next Next post: Do you need physiotherapy?